If your pond is not fitted with a surface skimmer then the SK1 Floating Skimmer is the ideal product for you. The SK1 Floating Skimmer adjusts to the water level in the pond. Mounted on the pondside the SK1 Floating Skimmer will keep the surface free of dust & debris. Connect the SK1 Floating Skimmer to a dry mounted pump, such as the Badu Top,Sequence or even Oase Aquamax.The unit comes with white plastic strainer basket for collecting debris. A stainless steel basket is available with a much larger capacity (at extra cost). A vac plate is supplied for connection to a pond vacuum kit. If used with a high pressure pump. If your pond is not fitted with a surface skimmer then it will greatly benefit from the Aquosis SK-1 Skimmer. Mounted on the poolside the Aquosis SK-1 Skimmer will keep the surface of the water free of dust, oil film and leaf debris. The benefits of this are a much greater uptake of dissolved oxygen, fewer suspended particles, less maintenance and better visibility. The Aquosis SK 1 Skimmer has two pipes coming verticaly out the pond, one is the suction to be connected to the pump inlet, the other is the return from the pump. The image opposite clearly shows the inlet where the water enters the pond, this can be adjusted to give you the perfect flow direction. The Aquosis SK 1 Skimmer comes with two pipe clips, which need fixing to the Coping stones to hold the skimmer in place. The vertical pipes you can see can be cut if required, or can be extended using Straight Unions if required, two 90 degree bends are also supplied with the unit. Push the 90 degree bends on to the vertical flow and return pipes, insert the two short lengths of pipes supplied in to the bends. Cut these to the required lengths and then secure in place by using the pipe clips. Prior to glueing make ensure that all pipework is cut to the required lengths. We even supply you with the glue! The Aquosis SK 1 Skimmer comes complete with the hose tails or unions as an alternative to glue on to the open end of each horizontal pipe. The returning water can pass through a filtration system or directly via the skimmer to the pond. This creates a current for your koi and moves the surface water to maximise the skimmer's efficiency. Please Note: SK-1 Skimmer comes complete with 1.5L Strainer Basket as standard. 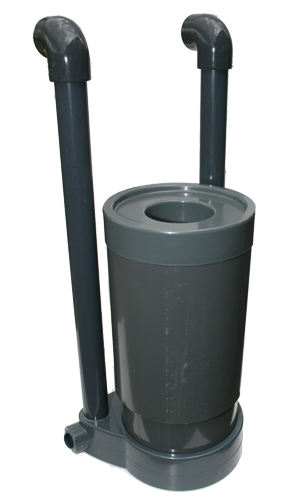 The Aquosis SK1 Skimmer unit comes with a white plastic strainer basket for collecting debris. A stainless steel basket is available with a much larger capacity. The returning water can pass through a filtration system or directly via the skimmer, creating a strong current for your Koi to swim in and enjoy.